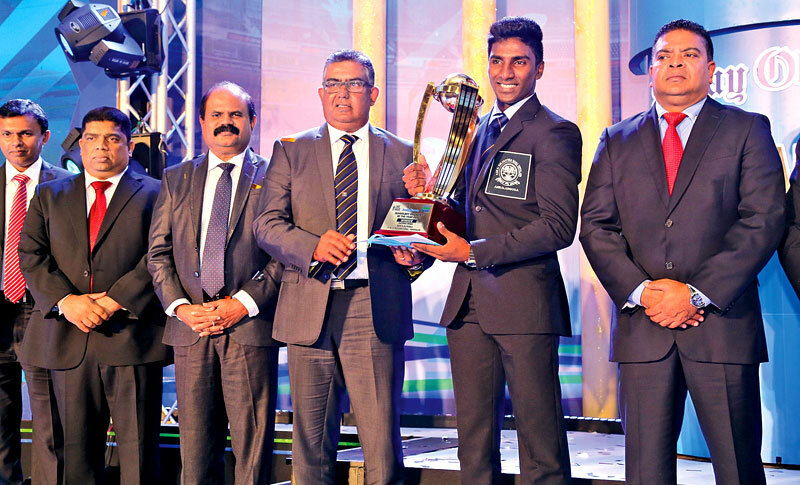 Tuesday will be another red letter day in Sri Lanka’s first-ever school cricket awards show – the Observer-Mobitel Schoolboy Cricketer of the Year unveils its 39th edition at the Grand Ballroom of the Galadari Hotel,Colombo commencing from 5.30 p.m.
ICC Chief Match Referee, Ranjan Madugalle spoke and recalled his early days as a schoolboy cricketer as some the best moments in his cricketing life. In conversation with the Sunday Observer, the first-ever winner of the prestigious Observer Schoolboy Cricketer of the Year award in 1979, said that he had thoroughly enjoyed his school cricket career at Royal College, Colombo. Stylish middle order batsman Dinesh Chandimal, the 2009 Observer-Mobitel Schoolboy Cricketer of the Year who was appointed the new Sri Lanka Test captain last week, is the fifth winner of the Mega Award to lead the Sri Lanka national team at the highest level. The grand finale of the Observer-Mobitel Schoolboy Cricketer of the Year 2017 will be held at Galadari Hotel, Colombo on July 25. As the Mega Show approaches, it will be interesting to have a look at the past winners of this prestigious title, which has unveiled many legendary Sri Lanka cricketers. The Observer-Mobitel Most Popular Schoolboy Cricketer of the Year 2017 would be known in exactly a fortnight’s time! Voting for the 39th Observer-Mobitel Most Popular Schoolboy Cricketer of the Year contest, now being conducted under three divisions, will close on July 14. A MONTH MORE FOR THE MEGA SHOW! It’s exactly a month away from this year’s Observer-Mobitel Schoolboy Cricketer of the Year Mega Show – Sri Lanka’s first-ever school cricket awards show, organized by the country’s flagship English newspaper Sunday Observer and sponsored by the national mobile service provider Sri Lanka Telecom Mobitel. Former Observer-Mobitel Schoolboy Cricketer of the Year award winners -Niroshan Dickwella (2012) and Kusal Mendis (2013) made their presence felt with three blistering innings for Sri Lanka at the ICC Champions trophy tournament which concludes in England today. Although Sri Lanka failed to qualify for the semi finals, Mendis and Dickwella come out with some explosive batting in Sri Lanka’s Group ‘B’ qualifiers. Mendis was the architect of Sri Lanka’s solitary win in the tournament. His excellent batting display of 89 off 93 balls with one six and 11 fours helped Sri Lanka humble the much fancied India by a convincing margin of seven wickets at Kennington Oval in London. The last day for voting for the Observer/ Mobitel Most popular Schoolboy Cricketer Of The Year Contest will be June 25th as the stage is set to conduct the 39th Schoolboy Cricket of the Year contest on July 25th at the Galadari Hotel Main Ball Room.The final selection of the winners were completed by a distinguished panel of cricket umpires of the Association Of Cricket Umpires in Sri Lanka and the names of the winners will be revealed soon. Former Sri Lanka captain and ICC Match Referee Roshan Mahanama, the first to win the prestigious Observer Schoolboy Cricketer of the Year on successive occasions way back in 1984, is one of the greatest stars who had emerged through the Mega Show.